Spencer, K., L. (1990) Rescuing the female child: The fiction of Joanna Russ. Science Fiction Studies, 17-2, 167-187. In “Rescuing the Female Child: The Fiction of Joanna Russ,” Kathleen L. Spencer reviews the prominent theme of “rescue” in the span of works by Joanna Russ. She begins the article by delimiting “feminist utopias” not as utopias that happen to be feminist, but as “places which are better for women for explicitly feminist reasons” — a definition that provides a useful framework for parts of her following argument. Spencer argues that the versions of “rescue” prevalent in Russ’s works can be organized into five major stages that generally circulate around the interaction between a woman in her early-middle age and a child either on the brink of puberty (age 12ish) or of sexual awakening (17ish). She then goes on to describe the plots to many of Russ’s works in a sort-of chronological affiliation with these progressing stages. 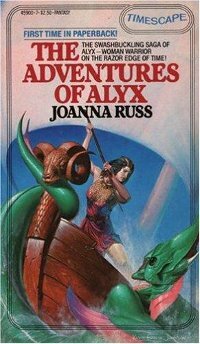 For example, the first stage represents the actual “physical” rescue of the female child, embodied in Russ’s early Alyx stories (cover featured above) from 1967 to 1970, from a life-threatening situation, or from a hopelessly patriarchal society. The third book in this series also marks the emergence of the second stage of rescue in Russ’s works: “rescue of the child from the psychological crippling of a culture which devalues her as female” as well as the fourth stage, described by Spencer, as an instance of time-travel or time-loop where the woman travels through time to rescue oneself from similar situations. This moment, early on in the article, is when the stages and categories begin to fall apart before Spencer’s very eyes — though she seems either not to notice, or not to care. The chronological/maturation progression of these stages becomes blurred when Spencer begins to talk about the progression of Russ’s repertoire, during which the beloved SF author is clearly discovering for herself that these categories are complex and perhaps unnecessary. Spencer commences to loosely (and rather unsuccessfully) apply her constructed theoretical framework to a great number of Russ’s works (both SF and non), which all generally begin to include a large age gap between two women who become romantically and/or sexually involved with one another. The end of the article reads like a realization in a journal entry, wherein the writer works through a problem on paper, and doesn’t bother to go back and change the work. She attempts to theoretically frame the recurrence of these lesbian relationships throughout Russ’s work, firstly by citing Gilligan’s In a Different Voice, (the theoretical summation of which, as explained by Spencer, sounds to me like a thinly-veiled exercise in Freudism) to describe the politics of separation in young men and young women from their parents, and the psychological implications therein. She then utilizes this assumption to posit that the young women in Russ’s stories need to be rescued by older feminist women because these tales take place within patriarchal societies, and that the “child” must be advised by a feminist woman instead of a man during her emergence as a sexual being and therein adult. This is beside the fact that many of Russ’s stories tell the tale of the younger woman “rescuing” the elder, in Spencer’s terms — but that goes unnoted. She notes that young women can therefore not receive this guidance from their mothers, but in doing so is seemingly implying that mothers in a patriarchy are a veritable “lost cause,” in terms of feminist reclamation, which frankly seems like kind of a cop-out. I’m still awkwardly fumbling around the world of fanmedia, especially in terms of literary fandom (help! 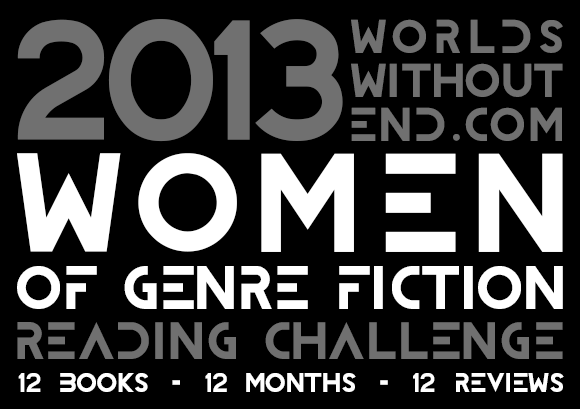 ), but I did find this expansive SF/SpecFi/Horror literature blog that has a whole link and section dedicated to women writing in these genres. Each author has her/his own page (here is Le Guin’s) which includes a (very) brief bio as well as the site’s stockpile of reviewed works by each writer. This would be a great resource and/or place to contribute the information we dig up about our various feminist authors this term! Beyond this term, this reading/reviewing contest looks pretty appealing as well, though we might be too far into 2013 for it.